Active substances from veterinary medicines behave very differently in the environment depending on substance and location properties. This illustration visualizes the processes of degradation, runoff, accumulation, uptake and infiltration of veterinary drugs in the environment. Active substances from veterinary medicines behave very differently depending on the substance and location properties. While sulfonamides, for example, can be transferred to groundwater, tetracyclines tend to accumulate in the topsoil. The infographic is licensed under a Creative Commons license CC BY-ND 4.0, i. e. it can be used without any changes, if the author is mentioned. 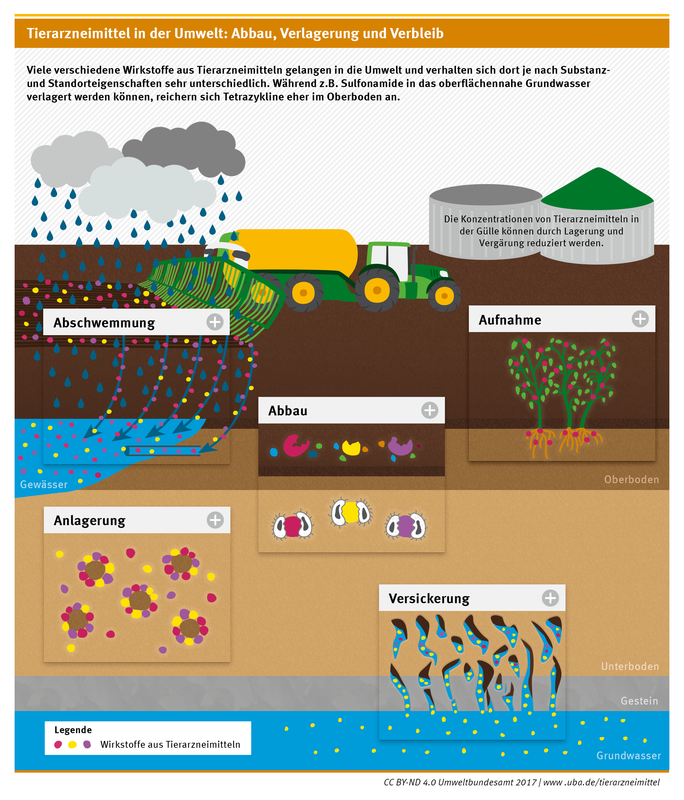 The infographic is part of a series of five infographics on veterinary pharmaceuticals in the environment developed by Ecologic Institute for the German Federal Environment Agency.